South Melbourne Town Hall, originally known as Emerald Hill Town Hall until the name of the municipality was changed in 1883, was designed by Charles Webb to house the Emerald Hill Town Council, Public Hall, Mechanics Institute and Library, Post and Telegraph Department, Police Department and Courthouse and Fire Brigade. It was built by Gillon and Treeby and officially opened on 30 June 1880. A large turret clock was added to the clock tower in 1881. The interior was refurbished and additions made in the 1930s to designs by Oakley and Parkes, undertaken by builder G. Farnsworth and supervised by City Engineer A. E. Aughtie. The low mansard towers that originally flanked the central tower were removed in 1945. The Town Hall, built on an elevated site, in the Victorian Academic Classical style with French Second Empire features, is a rendered building featuring a wide facade with a central portico and projecting pavilions at each corner. The facade is dominated by a giant order Corinthian colonnade expressed as pilasters along the walls, fluted engaged columns on the pavilions and freestanding columns on the projecting portico with a triangular pediment embellished with the words 'Town of Emerald Hill' and the municipality's coat of arms. A tall tower with a cupola, mansard and Baroque colonnettes clustered at its base is centred behind the pediment. The side facades have detailing of comparable complexity to the front facade. The Jubilee Fountain, situated in the forecourt, was designed by G H Henderson and built in 1905 to commemorate both the jubilee of the municipality and the 140 local residents who fought in the South African Boer War and the 8 who died. The tall, temple-like fountain is set on bluestone steps with granite columns and canopy, brass font and two bronze plaques. The fountain is surmounted by ironwork supporting three gas globes constructed in 1994 as a reproduction of the original design. South Melbourne Town Hall is of architectural, historical and social significance to the State of Victoria. South Melbourne Town Hall is of architectural significance as an outstanding example of a Victorian Academic Classical style building with French Second Empire influences. While the Bank Street facade with its giant order Corinthian portico displays a monumental symmetry, the east and west facades are also well resolved and the northern elevation features an accomplished articulation of the various functional elements contained within the complex. It is an important and sophisticated example of the work of architect Charles Webb, one of the leading architects of the 19th century. The Town Hall is further distinguished by its outstanding landmark and townscape qualities. Set on the crest of a hill with a forecourt, fountain, four street frontages and a framed vista to the portico and tower provided by the planning of Perrins Street, the building enjoys a prominent position unparalleled in Victoria. The interior, remodelled by Oakley and Parkes with some of the work carried out by Brooks Robinson, is a fine example of 1930s design incorporating blackwood panelling and a redecorated auditorium with special acoustic treatment and ventilation. 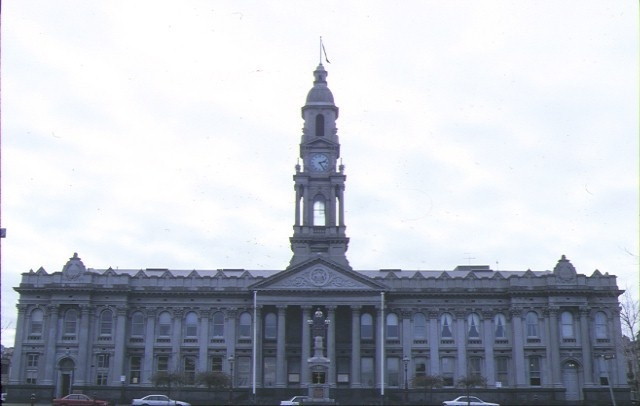 South Melbourne Town Hall is of historical and social significance as the civic centre of South Melbourne over a long period. 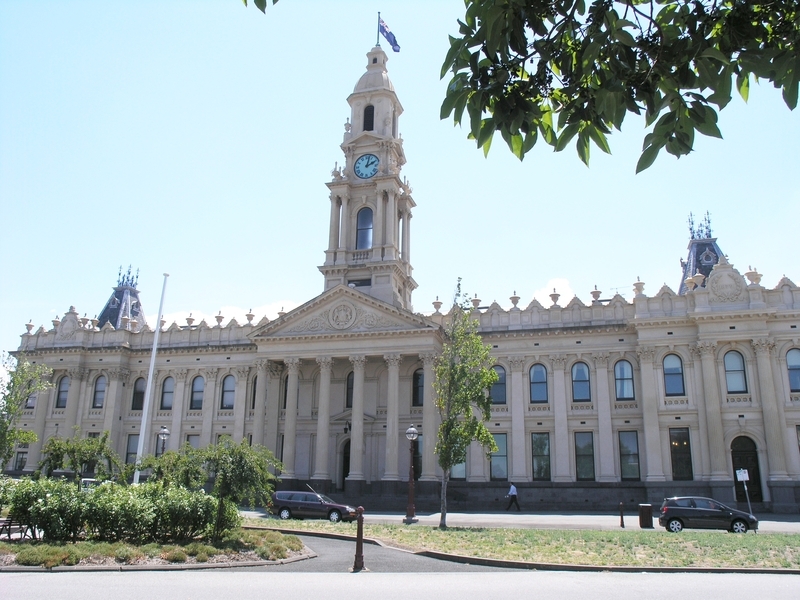 One of Victoria?s grandest town halls, the monumental building symbolises the prosperity and confidence of South Melbourne last century when it was one of the first municipalities to be changed from a town to a city after the 1874 Local Government Act. The Town Hall has a long history as the centre of community cultural life. It was the first Town Hall to achieve an integrated municipal facility with a range of functions. The Jubilee Fountain is of historical significance for its associations with the jubilee of the first working council outside Melbourne and Geelong. It is also of historical and social significance as a memorial associated with the Boer War in Victoria and symbolises the deep sentiments of the community towards this important event in Australian history. The importance of the fountain lies in the combination of associations with the Town Hall, the jubilee of the municipality and Boer War commemoration. South Melbourne Town Hall, 208-220 Bank Street, South Melbourne, Port Phillip City Council. 1. All of the buildings marked B1 (South Melbourne Town Hall) and B2 (Jubilee Memorial Drinking Fountain) on 600364 held by the Executive Director. 2. All of the land marked L1 on Diagram Number 217, held by the Executive Director being part of the land described in Certificate of Title Volume 1488, Folio 585 and all of the land marked L2 described in Tree Reserve, Gazetted 26 July 1905, p2806. 3. 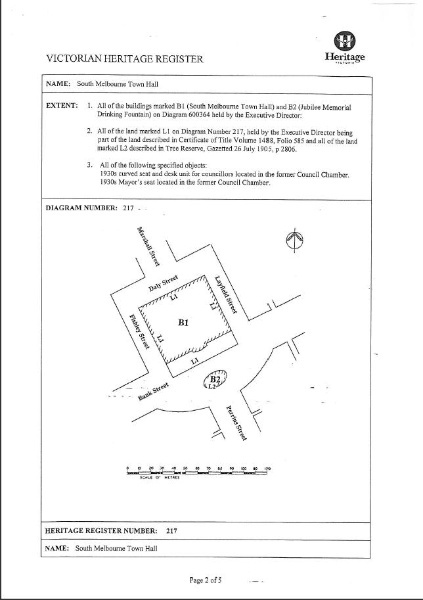 All of the following specified objects: 1930s curved seat and desk unit for councillors located in the former Council Chamber. 1930s Mayor seat located in the former Council Chamber. South Melbourne Town Hall, originally known as Emerald Hill Town Hall until the name of the municipality was changed in 1883, was designed by Charles Webb to house the Emerald Hill Town Council, Public Hall, Mechanics’ Institute and Library, Post and Telegraph Department, Police Department and Courthouse and Fire Brigade. It was built by Gillon and Treeby and officially opened on 30 June 1880. A large turret clock was added to the clock tower in 1881. The interior was refurbished and additions made in the 1930s to designs by Oakley and Parkes, undertaken by builder G. Farnsworth and supervised by City Engineer A. E. Aughtie. The low mansard towers that originally flanked the central tower were removed in 1945. South Melbourne Town Hall is of historical significance for its associations with South Melbourne, one of the first municipalities to be changed from a town to a city after the 1874 Local Government Act. One of Victoria's grandest town halls, the monumental building symbolises the prosperity and confidence of South Melbourne last century. It was the first Town Hall to achieve an integrated municipal facility with a range of functions. The Jubilee Fountain has historical associations with the jubilee of the first working council outside Melbourne and Geelong and with the involvement of Victorians in the Boer War. It symbolises the deep sentiments of the community towards this important event in Australian history. The importance of the fountain lies in the combination of associations with the Town Hall, the jubilee of the municipality and Boer War commemoration. South Melbourne Town Hall is an outstanding example of a Victorian Academic Classical style building with French Second Empire influences and exhibits a richness and diversity of features. While the Bank Street facade with its giant order Corinthian portico displays a monumental symmetry, the east and west facades are also well resolved and the northern elevation features an accomplished articulation of the various functional elements contained within the complex. The Town Hall is further distinguished by its outstanding landmark and townscape qualities. Set on the crest of a hill with a forecourt, fountain, four street frontages and a framed vista to the portico and tower provided by the planning of Perrins Street, the building enjoys a prominent position unparalleled in Victoria. The interior, remodelled by Oakley and Parkes with some of the work carried out by Brooks Robinson, is a fine example of 1930s design incorporating blackwood panelling and a redecorated auditorium with special acoustic treatment and ventilation. The Town Hall has social associations with the South Melbourne community as the centre of community cultural life over a long period. Installation, removal or replacement of garden watering systems, provided the installation or replacement of the watering system/s do/does not cause short or long term moisture problems to the registered structures. Repair of plasterwork provided that all new work matches good adjacent work in style, detail and finish. Installation, removal or replacement of carpets and/or flexible floor coverings, eg vinyl. Refurbishment of post-1940 bathrooms, toilets and or en suites including removal, installation or replacement of sanitary fixtures and associated piping, mirrors, wall and floor coverings. Installation, removal or replacement of kitchen benches and fixtures including sinks, stoves, ovens, refrigerators, dishwashers etc and associated plumbing and wiring. Installation, removal or replacement of electrical wiring provided that all new wiring is fully concealed and any original light switches, pull cords, push buttons or power outlets are retained in-situ. Note: if wiring original to the place was carried in timber conduits then the conduits should remain in-situ. Repairs, demolition or removal of suspended ceilings but not replacement. Repairs, demolition, removal, relocation and replacement of internal office partition walls to existing office spaces provided such works does not affect pre 1940 building fabric. All works should be in accordance with the conservation objectives of the Conservation Analysis and Management Plan prepared by Helen Lardner Conservation & Design, dated October 1995. Permit exemptions are given below which do not affect the overall significance of the structure or historic place and are generally for maintenance and minor works to the buildings. Generally, office areas and kitchens which have had regular alterations in the past should be able to carry out regular works which have no impact on he overall significance of the building without the need for a permit from Heritage Victoria.